The second release of December was The Hunting Ground and was easily my most anticipated of the two. Whilst I love McCoy, five releases is a lot for anyone and I’d enjoyed the previous sixth Doctor stories with Iron Bright, in particular, being a standout of last years main range. Not only that but we were constantly being reminded that this would be a riff on ‘Scandi-Noir’, utilising many of its tropes and merging them with a Doctor Who story. This seemed like it would be interesting after all scandi-noir are notoriously dark and usually it’s the darker main range adventures that get my attention. Unfortunately though, The Hunting Ground, whilst a noble attempt to try and do something a bit different, ultimately falls flat. Landing in Iceland, the Doctor (Colin Baker) meets with Inspector Ysra (Amy Beth Hayes) who is currently investigating a rather unusual murder. As the two work together, they discover alien hunters and a slew of devilish twists and turns. Unfortunately, the Doctors part in the investigating is somewhat minimal. Sent off onto another planet around the halfway mark, the Doctor becomes involved in a The Most Dangerous Game (1932) type scenario whilst Ysra is left to uncover most of the plot. Now I’m not an obsesser who believes the Doctor should always be the one to uncover the grand plan, far from it! No, my problem with this part of the plot is that- well there isn’t one. The Doctors section involves a lot of getting captured/getting away. Certainly, information is weeded out, but the time it takes to get there involves a lot of running around and not a whole lot of threat. Which brings me rather neatly to the next of The Hunting Grounds problems. The story is incredibly flippant. Towards the end, a number of moral issues are raised, primarily the question of loyalty. The problem is it’s incredibly difficult to take any of this seriously in a tale that features an incredible amount of absurdist comedy, including a talking Printer which becomes somewhat important later on. Most likely this is a matter of personal taste and I’m being incredibly unfair to author AK Benedict who has an incredible voice and a wonderful talent for dialogue. However, I can’t help but confess that The Hunting Ground left me feeling more than a little cold, partially due to the inconsistency of its town. However, AK Benedict really has made quite a coup in the creation of Inspector Ysra who Amy Beth Hayes brings to life so exquisitely. Along with Brunel in the aforementioned Iron Bright, she’s one of the best standalone companions of the year and one who I hope won’t be ‘one-off’ for much longer. Colin Baker, despite not being given much to do, is wonderful as ever. I felt like he was given the short straw this year, not that his stories haven’t been some of the best of the entire year but his ‘trilogy’ was loose and undefined and some episodes Hour of the Cybermen for example, didn’t really give him much to do. However, he seems to have taken it all in his stride and certainly when given the chance to shine he’s grabbed the bull by the horns and delivered some truly wonderful moments. I can’t wait to see what 2019 brings us for ‘Old Sixie’. I feel that in some way, I may have been too harsh on The Hunting Ground. It is a fun adventure and certainly has some intriguing twists and turns. Unfortunately, the tonal shifts I mentioned earlier proved to be just a little too much for me. However, with Shadow Planet AK Benedict proved herself to have an incredible talent for Doctor Who and I look forward to seeing what she comes up with next. Writer Justin Richards closes out his ...of War audiobook trilogy with this Sixth Doctor entry read by Colin Baker. The Doctor has long put off actually dealing with the World War I situation, but now that he is alone, not distracted, and out of excuses...he finally goes back to the Great War in order to fix it's jumbled timeline. I had found it problematic at the end of Horrors of War that the Third Doctor seemed to leave the situation with major threads dangling without solving it. At least when the First Doctor fell into the mess he was also being chased through time and space by Daleks (as his entry took place during the Daleks' Master Plan), but when he is confronted with the situation he left unfixed when he was in his Third Incarnation, it didn't really make sense for him to just say "problem for another day" and then put it off for seemingly centuries. There are other issues with this mangled timeline as well. When the Third Doctor and Jo landed in World War I, the timeline was askew and Jo knew the original timeline...but how can she come from a future where this timeline is mangled yet know the original. It just hurts the whole mangled timeline story when it doesn't really ripple into the future. I did like the melancholic tone the story had. But I did find that the Doctor's main reason for avoiding the problem, that he didn't want anyone to see what he'd have to do, fell flat when what he had to do wasn't really that cruel, so I'm not really sure I get why he put it off for so long. Complaints aside, there is still something of an interesting in story in this, and Colin Baker is a great narrator and always a joy to listen to. It isn't a bad way to spend an hour or so, but the basic mechanics of the time travel problems never truly gelled for me. There are kinks in the story that maybe could've been worked out if the story wasn't being stretched to three releases with three different Doctors. Had it focused in on one Doctor, maybe even two, I could've gone with it...but it just stretched the premise too thin to stretch it to a third incarnation. "Doctor.....are you saying you are not sure of something?" The Darkened Earth is my first encounter with Constance Clarke (Miranda Raison - also Tallulah in Daleks in Manhattan and Evolution of the Daleks), and I must say, what a wonderful companion she makes. Constance is clever, confident and a perfect foil for the sixth Doctor. Her plummy vowels and old-fashioned virtues are a breath of fresh air. The story sees the Doctor and Constance arrive in what they think is a rural post-war Britain when in reality this couldn't be further from the truth. After a slight glitch with the TARDIS's translation circuits, they realise they are in Germany, at the very height of the war. Not only do they need to dodge British bombs, but also a terrifying creature that feasts on whatever light can be found. John Pritchard's writing is tense and fast-paced. Constance is a serving WREN, and to put her behind enemy lines with a frightened family during a blackout is a very interesting plot twist. There would have been more than enough story farmed from this one idea, but add to this a creature that is stalking the darkened streets seeking light energy to feed upon, and you have a proper corker of a story that I can't recommend enough. The Darkened Earth is available from Big Finish HERE. 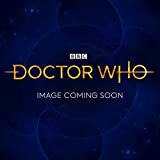 Hour of the Cybermen, is the second entry in this year’s UNIT themed multi-doctor main range trilogy, following on from the previous The Heliax Rift. To that end, it features the return of a number of characters from that story namely Blake Harrisons as Daniel Hopkins and Russ Bain as Colonel Price. Of course, for many fans, however, the main draw of this story is the return of David Banks and Mark Hardy as the Cyber-Leader and Cyber-Lieutenant respectively. The 80’s Cybermen have a curious longevity about them that make them something of a fan favourite. Whilst the Cybermen had already had several reinventions by the time they appeared in 1982’s Earthshock, this new version was so utterly modern and completely terrifying yet somehow evoked memories of their previous designs. Add to this Banks’s portrayal of a Cyber-Leader that somehow manages to have underlying currents of emotions, whilst debating their usefulness. Banks would return to play the role in three more serials; The Five Doctors, Attack of the Cybermen and Silver Nemesis, whilst Hardy would return in just two (The Five Doctors and Nemesis). Since then Banks became something of a ‘spokesperson’ for the Cybermen, writing an original novel and a ‘history’ of the Cyber-Race. However, it’s always been something of a missed opportunity that he, nor hardy, never got to reprise their roles for Big Finish….until now. So does Hour of the Cybermen provide the triumphant return for the Cyber-races two stars? Well yes and no, depending on your expectations. What hour isn’t is a dark exploration of what it means to be a Cyberman, along the lines of Spare Parts or The Silver Turk. No, Hour is more the Cybermen as ‘monster of the week’, featuring them using a dehydration weapon in an attempt to take over the earth. It’s pretty classic ‘alien invasion’ storytelling. However whilst the general plot may be somewhat basic, the way in which the story chooses to get from point A to B is not. There’s a hefty helping of ‘Sawardian’ nastiness in the way that some of the characters are dealt with and several brutal and distressing descriptions of Cyber-conversion. The story also chooses to play with our expectations of those characters we’ve already met in The Heliax Rift. Whilst the decisions these characters make may not always be wholly…convincing (without giving too much away, motivation seems somewhat thin for one individual), the grim, bleak world that Hour takes place in allows you immediately sympathise. Not only that but the story brisks along with so much pace that you can easily forget it, with a heavy emphasis on Cyber-Action. And what of Banks and Hardy themselves? Well in a word they are superb, it’s like they never went away. Banks, in particular, gets plenty of time to shine, including uttering some of his most famous catchphrases. However, it is his scenes with Russ Bain’s Colonel Price that he really gets to shine. In these moments Banks is utterly terrifying, reminding us immediately why his Cyber-Leader was such an imposing figure when he first stomped onto our screens in 1982. He also works particularly well against Colin Bakers Sixth Doctor, who seems to be relishing his first Cyberman story in quite some time. Their final confrontation is a hell of a moment and builds expertly on the tension achieved in what is an almost non-stop action thriller. Blake Harrison impresses again as Daniel Hopkins and is certainly given plenty of chances to show off his range, as does Russ Bain. Newcomers Frog Stone (Riva) and Wayne Forester (Atriss) are also given plenty of chance to shine, with my only regret being a lack of exploration of Rivas part cyber-conversion. 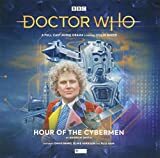 Hour of the Cybermen is a thrill-a-minute action adventure that manages to take two icons of 80’s who and give them the comeback they deserve. Highly recommended. Colin Baker (The Doctor), George Sear (Mathew Sharpe), Matthew Holness (Eric Drazen), Susie Riddell (Esther Brak), Ruth Sillers (Willoway), Jonathan Christie (Captain Schumer), Anna Barry (Juniper Hartigan), Dan March (Varian). Other parts played by members of the cast. The latest adventure for the Sixth Doctor in Big Finish's Monthly Range is a mildly enjoyable tale. Colin Baker, as always, delivers as the Doctor...but the story around him is average at best. That is not to say there are not good ideas, but the best idea of the bunch is undercut by the presentation...but will dive deeper into that in a moment. First, the story. The Sixth Doctor has been adventuring lately with a fellow named Mathew Sharpe. The two have been traveling for a bit, but the Doctor thinks it may be time for their adventures to come to a close. Before he takes Mathew home though, they answer a distress signal. They end up on a big ship in space being renovated into some kind of resort, but the creatures in tentacle robot suits that are renovating it begin killing people. The question is why? The problem with the big reveal is that it is totally undercut by the fact that we had never heard of this Mathew character before now. So the big reveal that he is actually an evil alien that was trying to trap the Doctor loses some impact in that we don't know Mathew. We haven't spent time with him, so the reveal that he is secretly evil isn't too shocking. As the story progressed I figured he was going to either die or be a villain. If they had actually lead up to this story with Mathew, it may have had more impact. But I don't care that the Doctor loses a friend here, because I never met him before this story. I am told they adventured together, but I never experienced it. So this is a hit and miss story for me. It doesn't do anything too new or creative, and the most intriguing element...a companion that is secretly evil all along, lacks the impact it may have had if they had actually had a series of adventures leading up to this moment. Instead it feels like a climax to a story I missed out on.